Having completed my 160-hour internship with Smithsonian Global and the University of Pennsylvania, it is my pleasure to provide a final reflection and tour of my work on the Conflict Culture project. Our intern cohort, using excel spreadsheets with partial data, were assigned countries such as Morocco, Finland, Poland, Denmark, and Ireland. I was assigned Ireland and worked on this data set throughout the semester. In addition to research and data entry, our group created a test map component using Google Fusion. These datasets and maps will be used for multidisciplinary research on cultural heritage in order to prevent intentional destruction, assist in recovery following natural disasters, and generally protect historical sites as well as the collections of museums and archives. At this time, we were unable to create a “clustering” function and so the map appears quite busy when zoomed out. The final product, however, once the user drills down and clicks on a data point, is a pop-up window with all relevant information for each site (above). Our group selected not to show some of the coding that would not be meaningful to a general audience at this time. For example, we coded each entry to show whether the site was state-sponsored and/or prior military function. We also ranked its significance as 1-international, 2-national, or 3-local. Our group discussed different ways to represent this information and it was determined that, at a later date, the Smithsonian can choose to color code these or build additional layers. We did color code sites based on complete, partial, or coordinate-only data (below). Uploading the data was fairly simple, the excel was saved as a CSV file. A CSV stands for comma separated values file, which allows data to be saved in a table structured format. CSVs look like an excel spreadsheet but have .csv extension instead of .xlsx. A CSV takes the form of a text file containing “information separated by commas,” for which it is named. From the file menu, users select import rows, which is followed with the following screen. 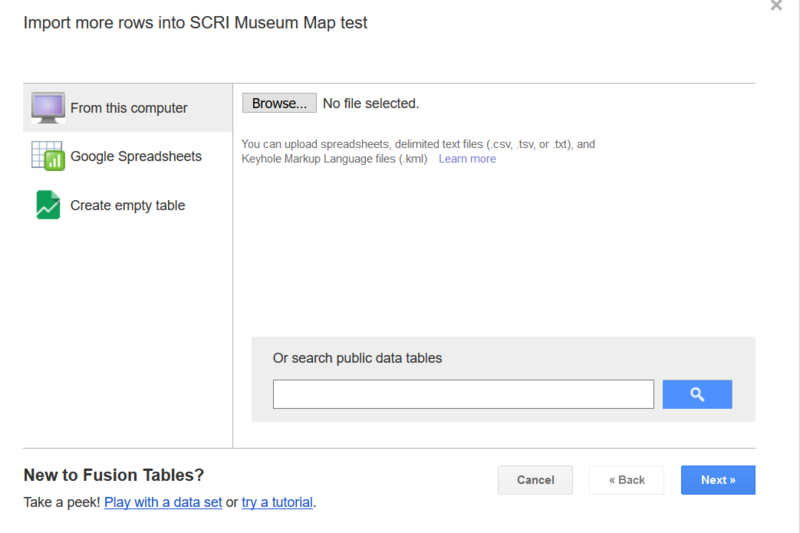 From here, the user can upload the file from their computer, link a Google spreadsheet, or build a table from scratch (above). Once uploaded the data sheet could be viewed as rows (below) or cards (above). We used a cultural repository code book and instruction manual provided by Smithsonian Institution. My research focused on Ireland’s sites related to the cultural heritage, which include: historic sites, religious sites, libraries with exhibits, archives, art galleries, museums, and archaeological sites. Historians are rarely short-winded when writing; thus, it required work and discipline to properly code and describe in 25-30 words each site/entry. I gained experience in using scientific methods to integrate qualitative information into a standard frame of variables and data formatting. This is a great and worthy project. Through this research, I gained a deeper appreciation for the importance and complex interpretations of cultural heritage. 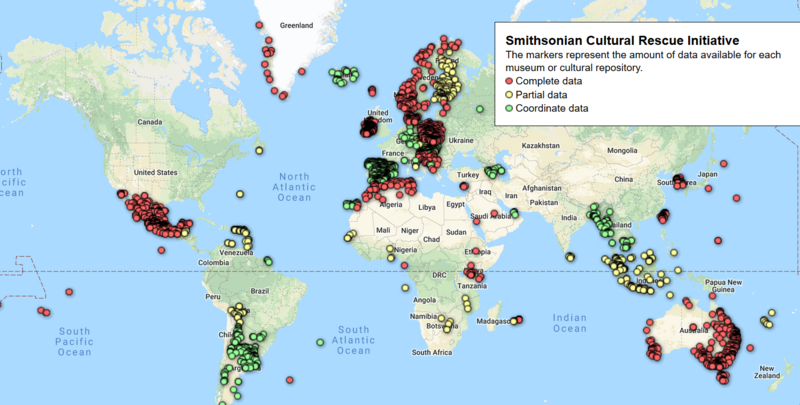 I also see this as a way to elevate traditional museum/archive/site indexes so that they are more accessible and visual for scholars, hobbyists, students, national and international bodies, and the larger global community. My DH skills, gained through George Mason’s post-graduate DH certificate program, came into play on several occasions. I understood the importance of controlled vocabulary, metadata, and DH tools and terms needed to ask and answer questions. As far as digital skills gained, I learned the basics of using and working with Google Fusion. On a personal level, I learned a great deal about the rich history of Ireland from Dublin Castle to the National Leprechaun Museum. With over 300 cultural heritage sites, I will surely build my next trip itinerary to Ireland around my work on Conflict Culture. My Smithsonian internship is still going well as I research cultural and heritage sites in Ireland. I have completed 60% of the coding for these sites and will soon be turning my attention to mapping. Researching the significance of Kilkenny Castle was both challenging and enjoying. Kilkenny Castle has a complex history that involves architecture, politics, history, archaeology, culture, and various military functions. At present, it also serves as an important site for public audiences across multiple disciplines on local, national, and international levels. This site was part of my research for the Conflict Cultures project, which connected me to the Smithsonian and the University of Pennsylvania as a digital historian and digital humanist. For example, only a handful of entries involve both a prior military function and a current relationship to the state. For these categories I coded them both as “1” that designates it as a site that could be potentially endangered if Ireland ever experiences either a national or man-made disaster (civil war, terrorist attack, hostile occupation). In other words, coding and mapping this site will help future generations protect, preserve, and learn about the important role of Kilkenny Castle in Ireland’s history. 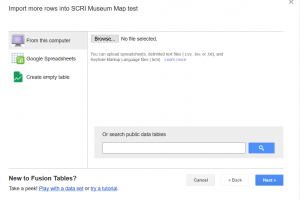 While I have never used Google Fusion Tables as platform for GIS mapping, this entry (along with 318 others) taps into the mapping skills gained through my digital public humanities coursework through George Mason University. Normek82, Kilkenny Castle, 2015 (Wikimedia Commons, CC 4.0). Kilkenny Caste sits atop a hill over the River Nore in what is called the “High Town” of Kilkenny City. It was originally an Anglo-Norman stone castle built by William Marshal, the Earl of Pembroke in the early 1300s. In the late 1300s it became the main residence for the Butler family, one of the most powerful families in Ireland, represented by generations of Earls and Marquesses of the Ormonde nobility. It would remain a part of the Butlers for nearly 600 years. Daniel Bron, Kilkenny Castle and Fountain, 2013 (Wikimedia Commons, CC 3.0). It primarily features medieval and baroque architecture. In addition to serving as a residence, the castle also served as a fortress. The buildings have been in the care of the Office of Public Works since 1969. Visits to the Kilkenny Castle feature several types of collections: decorative arts, art, textiles, print materials, military artifacts, and archaeological artifacts. The mission of the Kilkenny Castle and the Office of Public Works includes archaeological excavation, conservation, preservation, and restoration of the buildings as well as the collections. Bence-Jones, Mark. A Guide to Irish Country Houses (London: Constable Press, 1998). Bron, Daniel. 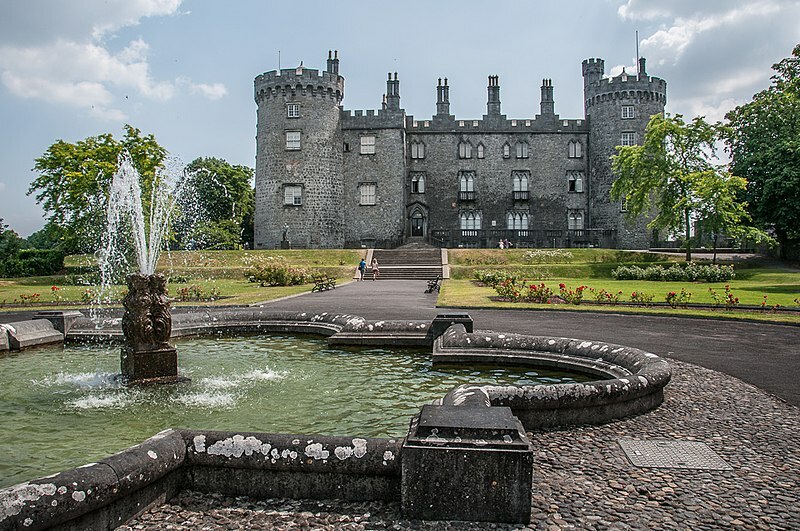 Kilkenny Castle and Fountain, 2013 (Wikimedia Commons, CC 3.0). Department of the Environment. An Introduction to the Architectural Heritage of County Kilkenny (Government of Ireland, 2006). Murtagh. Ben. “The Kilkenny Castle Archaeological Project 1990 to 1993,” Old Kilkenny Review (Kilkenny Archaeological Society, 1993). Office of Public Works, “An Introduction to Kilkenny Castle,” Kilkenny Castle (Government of Ireland, 2017). Williams, Jeremy. A Companion Guide to Architecture in Ireland 1837– 1921 (Dublin: Irish Academic Press, 1994). My internship with the Conflict Culture project has been very interesting thus far. I was assigned Ireland as my country to research with the goal of providing information to be used in the ultimate database. I was faced with some initial challenges as some of the information had already been entered by a previous intern. Checking geographical coordinate proved tedious, and learning to locate precise latitude and longitude was a task with which I had little experience. However, I found that I gained efficiency and speed as I moved through the 319 sites. I am now finished checking preexisting data and have moved to research and descriptions of my own. I have particularly enjoyed getting to learn about historical and cultural sites in Ireland. Other than some of the well-known sites, such as Dublin Casle, I had/have very little familiarity with Ireland as I have never been there. While I am only 20 percent through the site descriptions and other coding categories, I have already begun a list of sites that I would like to visit when I do travel to Ireland. In fact, I may be making a trip sooner than I thought — inspired in part by this project and assignment. While my work constitutes a long distance relationship (of sorts) with the Smithsonian, the weekly conference calls have been helpful. In addition, they add a personal component to this virtual internship as our supervisor guides us and answers questions and as we, the interns, talk about our work. The communication with the Smithsonian and the University of Pennsylvania has also been great. This project utilizes several skills and methodologies connected to the GMU DH certificate program. Specifically, our early lessons on the importance of copyright and metadata have come in very handy. I also have greater confidence in my research skills, understanding of coding categories, and use of controlled vocabulary. George Mason is on spring break next week and so we have a week off as well. I am looking forward to a bit of a break before getting back to work. I am determined to finish the data for Ireland as my contribution to Conflict Cultures. I am looking forward to taking HIST 689 with Dr. Kelly as the final online course for the post-graduate certificate in Digital Humanities through George Mason University. In the first two courses I gained a real sense of the trends, direction, and scope of Digital Humanities. In addition to technical expertise, the courses also provided meaningful readings and activities. I hope that this class will further add to this new base of knowledge and skill. Professionally, I juggle several different roles. I am a secondary school educator at the Harpeth Hall School where I also serve as the archivist. I also teach as an adjunct at Belmont University in the Honors program as well as the Global Leadership studies department. Most recently I taught an interdisciplinary class entitled “Making the Modern City.” In the last several years, I have also added author to my list of professional achievements. This fall will bear the fruit of two and a half years of research and work with the release of two books. Athens of the New South: College Life and Making Modern Nashville will be published by University of Tennessee Press and A Heartfelt Mission: A History of the West End Home Foundation published by Orange Frazer Press. Adding my GMU coursework on top of my day job and writing this past year was a challenge but well worth the time and effort. Next year I will add Digital Humanities Coordinator to my list of duties at Harpeth Hall, and I will be continuing the development of my project from Dr. Leon’s class in partnership with the Metropolitan Historical Commission. The project, Nashville Sites, will be modeled on the History of the National Mall project and will initially launch this fall with continued development (and funding, fingers crossed) in 2018. I look forward to this course, and I hope to find a way to incorporate and tailor my work in HIST694 to further Nashville Sites as well as my work with teachers (as Digital Humanities Coordinator) at Harpeth Hall. How can marker content be complemented with other primary sources to convey a more engaging and important story. How can this digital history project combine individual entries for markers to create a broader historical narrative for downtown Nashville’s historical site markers. In what ways can I connect this project to other significant downtown sites where there are not metro historical markers. How can I best engage audiences both local and visiting to participate in the walking tour, and how can I best use historical scholarship to support this project. Are there connections to the broader arts and humanities community that I can easily incorporate? Omeka will be the primary format for “Nashville Sites” with an interface based on a modified version of “Histories of the National Mall.” This project, sponsored by an NEH grant and developed by George Mason University and the Roy Rosenzweig Center for History and New Media leads the way in digital histories based on public history sites within a particular geographical area. “Nashville Sites” will follow a similar thematic layout based the following categories: maps, explorations, and places. In contrast to mallhistory.org , this project will designate and create a walking tour based on existing, physical historical markers. The site for this project is nashvillesites.org and relevant primary documents will be available for each destination point. These primary sources include images, renderings, and other media files. In addition to these project resources, digital technologies will enhance metadata available via public records. 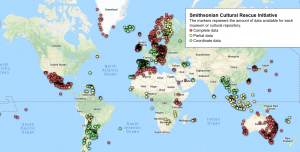 Curatescape will be used to provide latitude/longitude for geo-spatial mapping, Omeka exhibits will organize marker text and context, and there will also be additional outside links related to selected markers. Points to be included for this project range from the earliest known business to the Ryman Auditorium to historical churches to government buildings. The timeline for the project, for this stage, is May 2017. However, it is my hope that funding from MHCF will continue this project until all 150 markers are part of the digital project. There are several targeted audiences: visitors (tourists), local residents, and students. Reaching these audiences will depend on whether or not the project is user-friendly, which is why I am using a web rather than an app-based platform. Evaluation of “Nashville Sites” will be determined, in large part, by the number of hits the site generates from month to month once fully functional. Distribution and sustainability with specific public user groups will depend on continued support and funding through the MHCF, the development of a social media presence, and the promotion of nashvillesites.org via visible signage on the markers themselves and brochures (and the like) in local businesses and hotels.